The gardens have been planted with every effort made to achieve botanical and historical accuracy. References especially helpful in the planning of the gardens were Plants of the Bible by Harold and Alma Moldenke and Planting a Bible Garden by F. Nigel Hepper. Each plant is labeled with a marker bearing its name. 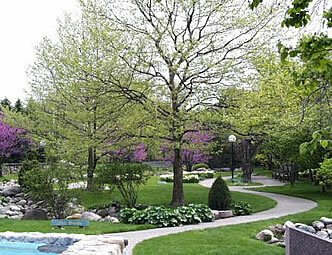 The gardens, situated on approximately 3/4 acre, currently contain over one-hundred plants that are named in the Bible. A diversity of climates can be found in the Holy Land, which allows for most of its plants to be grown somewhere in the US. These gardens represent those plants hardy enough to the environs of the Midwest to survive here. Several tender plants that are grown in the gardens are wintered in greenhouses from October to April. The Warsaw Biblical Gardens are thriving. We would like to thank the community for their continued support and interest in the gardens.